An Air Force officer recalls a ‘dangerous and stupid’ sortie he undertook on the world’s highest battlefield. This is AVM Bahadur’s ‘The Track’. ‘The Rope’, in Siachen parlance, has come to symbolise the link that binds personnel serving on the glacier. As they move up and down the glacier in single file, tied to each other by a rope, the tenuous link to this world is graphically described by Capt. Raman when the last in a file falls into a crevasse — the link ends when the rope is ordered to be cut by the team leader when he realises that the jawan is pulling down everyone else attached to the rope. 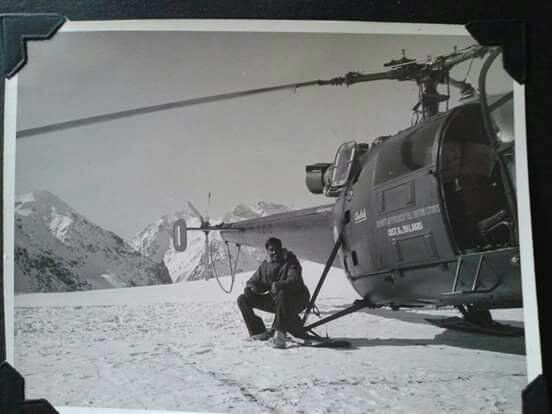 The jawan now gets stuck between two ice walls and cannot be pulled out and the specialist avalanche evacuation leader, who had been helicoptered-in for the rescue, takes a decision to end the doomed jawan’s misery. It is a decision one wishes should not befall one’s enemy too. In the fading light of the evening and gathering winds the team leader boards the chopper, the screams of the doomed soldier ringing in his ears above the helicopter engine and rotor noise. The scene now shifts to the helicopter flying back to Base Camp — and this is what would have happened. 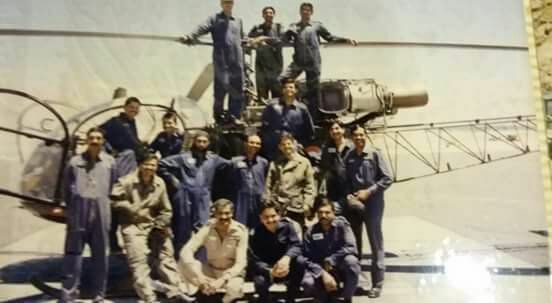 The Siachen Pioneers with a Cheetah in a photo from 1997. AVM Bahadur is standing on the extreme right. A quick glance inside on the artificial horizon shows that he has 15 degrees bank but the rate of climb and descent indicator shows a slight descent. He gives a touch of power to stop going down and moves his eyes out of the cockpit again. “Do you spot anything on ground,” he asks the youngster. “No sir,” replies a nervous voice. Suddenly, a small black spot comes into view that shows the helicopter is really close to the glacier floor. “Are you orientated?” he asks hoarsely of his co-pilot. “It’s all white sir,” says the rookie youngster. The captain scans furtively ahead and the sweat he was breaking into, despite the 20 degrees Centigrade temperature in the cockpit, stops as the track comes into view, clouds start thinning and the valley floor starts emerging — it’s just like magic, the captain is orientated again; he reduces bank and comes up on collective to stop further descent. As he looks down he sees a file of soldiers trudging up on the track, bound to each other with a rope, and they wave at him; as he looks right, the hillside just whizzes past, the tough rocky protrusions from the snow clearly visible — he is that close. His warm inners under the flying overall are wet with perspiration, he is hyperventilating despite inhaling 100 per cent pure oxygen through his mask and his jaw has clenched into a tight ball that he now tries to loosen. 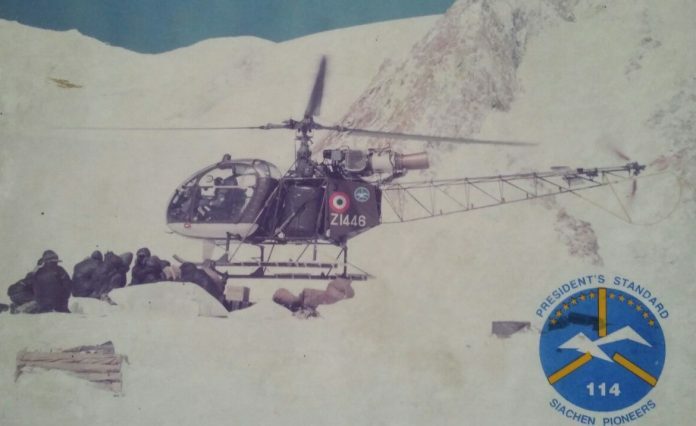 (The author had two tenures in the Siachen Pioneers, the first in 1978-1982 and the second one as its Commanding Officer 1993-1997. He is now a Distinguished Fellow at Centre for Air Power Studies, New Delhi).